My birthday present came from my Mom on Tuesday. 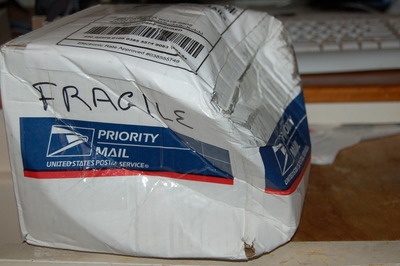 Inside this box, were a few lightly damaged items (nothing too bad). The first thing I pulled out were Smarties. Smarties are some of the best chocolates in the world, think mm’s but ten times better. The was also the second season of Lost. One of my favoritest shows ever. It joins the ranks with the likes of Globetrekker, Good Eats, Worlds Apart, X-play (old x-play), and a few others. I got a journal too, with a check in it for China. Fun fun fun. So I am better. This past week has been really, really <sarcasm>fun.</sarcasm> My feeling have been tied into knots twice. Good knots. Knots that I wasn’t able to untie myself. The first one I gave it to God that same night. The second though, that didn’t happen till Wednesday morning. It was kind of cool, cause once I did, it just wasn’t there anymore. Well I am off to bed, I miss it and I am pretty sure that it misses me. This entry was posted in Life on September 29, 2006 by Andrew. This entry was posted in Life on September 27, 2006 by Andrew. One day, when it doesn’t matter, I will tell you everything. This entry was posted in Life on September 26, 2006 by Andrew. One day, when I get good, I will make a character of her. But I will have to be good, for I will be dealing in words, and words are powerful. It will be a balancing act, a battle in the reader’s mind of her beauty and the words she says about herself. This entry was posted in Life on September 25, 2006 by Andrew.